Psalm 112:1 -NKJV- Praise the Lord! Blessed is the man who fears the Lord, who greatly delights in his commandments! Ecclesiastes 12:13 -BSB- Fear God and keep His commandments, because this is the whole duty of man. 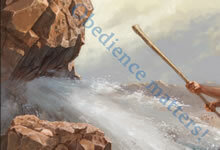 Obedience matters - if you have not obeyed God’s plan of salvation for this dispensation yet, then don’t, delay it. Have you already obeyed the Gospel? The Bible tells us in 1 Samuel 15:22: Has the LORD as great delight in burnt offerings and sacrifices, as in obeying the voice of the LORD? Behold, to obey is better than sacrifice, and to heed than the fat of rams.